1. 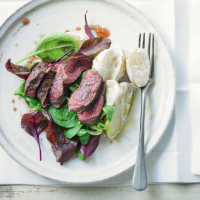 Remove the venison from the fridge and set aside for 15 minutes. Bring the potatoes to the boil in a pan of water and simmer for 15 minutes until tender. Mix the horseradish with 1 tsp oil, the buttermilk and season. Cool the potatoes for a few minutes then toss into the buttermilk dressing and set aside. 2. Pat the venison dry with kitchen paper, then rub with 1 tsp oil, plus the thyme and some seasoning. Warm a non-stick frying pan over a high heat. Sear the venison for 2½-3 minutes on one side, then 2 minutes on the other. 3. Add the redcurrant jelly and vinegar to the pan, they will bubble dramatically, then immediately remove from the heat. Leave the venison to rest in the sauce for 5 minutes with the pan covered loosely with foil. Slice the meat across the grain, then serve on top of the salad leaves, and drizzle the syrupy pan juices around. Serve with the potatoes.